Factory-installed AFS AccuGuide autoguidance systems offer unsurpassed dependability and convenience, providing year-to-year repeatable accuracy, as tight as plus or minus 2.5cm. Building guidance capability into our tractors at the Case IH plant ensures factory testing and a higher level of quality control. Case IH guidance technologies like AFS AccuGuide can be tailored to your operation’s needs to help you increase accuracy, efficiency and productivity. AFS capability is built right into Case IH LB4 balers. Monitor all baler functions and receive key information in real time including bale weight and moisture content plus mis-tie alerts. A camera feed can be used to keep an eye on bales as they are ejected from the chute. In addition, Case IH AFS Pro displays can be used for GPS data logging and transfer to desktop software. Use AFS AccuGuide during tillage operations to reduce skips and overlaps, map the ground you have worked, save on fuel and labor costs and simplify operation to add hours to your day. Plant seeds within one inch of this year’s rows, 95 percent of the time. AFS AccuGuide helps you increase your speed and efficiency while planting or seeding with fully integrated, hands-free assisted steering. Minimise skips and overlaps to save on seed, fertiliser and chemicals and maintain straight, repeatable rows. AFS AccuGuide provides accurate, handsfree assisted steering during harvest to ensure consistency of operations while reducing operator fatigue. All Case IH headers delivered in Australia since 1998 are fitted with real time yield monitors. When a GPS signal is combined with these monitors accurate spatial yield maps can be produced to record productivity and generate informed future precision farming decisions. 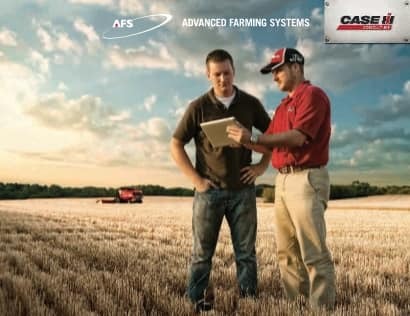 Case IH Advanced Farming Systems (AFS) is dedicated to helping producers in an agricultural environment that runs on technology. AFS delivers an integrated, less complex precision farming solution built right into Case IH equipment using a single display across machines. Built on open architecture, AFS can interface with a range of your existing equipment. From trained AFS technicians at your local Case IH dealership to Case IH field staff, support services and AFS Academy trainers, Case IH is here to help you maximise your operation’s potential and keep you rolling. Our fully integrated precision farming tools offer open architecture to work across your equipment platforms and crop windows. Precision systems have never been easier to use or more reliable, helping you make the most of short windows during critical seasons. Case IH AFS gives you built-in precision technologies to improve your productivity and agronomic performance while minimising input costs and helping you manage your risk. A single Case IH AFS display serves as your equipment control center and works seamlessly across product lines. Similarly, a single software suite lets you view, edit, manage and analyse all your precision farming data. Our customer-driven design and intuitive innovations deliver more opportunity with less complexity. Precision farming technology is constantly evolving, and Case IH is committed to staying on the leading edge. An integrated ISO-task controller is built into new Case IH equipment and this technical advancement will further simplify AFS all-makes compatibility. Case IH integrated precision farming solutions allow you to operate your Case IH tractor and an existing implement together with a single, easy-to-use display. Case IH AFS ISOBUS-Task controller SW utilises components and systems currently available in the marketplace, along with the AFS Pro 700 display, to use a single monitor to perform precision farming tasks, even when your tractor is paired with implements built by other manufacturers. Case IH helps you Be Ready before you head to the field, with technical training available through AFS Academy and your AFS dealer. Once you’re in the field, your dealer is just a phone call away. In addition, our team of AFS and product specialists is trained to support your dealer and meet your needs. Our AFS Support commitment keeps you rolling.